This is an experiment. Just tweeted that Jan van Roekel and I open a Clos de la Roche Cuvée Vieilles Vignes 1997 from Domaine Ponsot, and that we will blog about this (monumental) wine simultaneously. Perhaps an annoying experiment, because it is not the most relaxed way of drinking a great wine... we'll see. Stupid: I can rotate this photo in Twitpic, but not save the rotation...! Anyhow, the wine: as said, the nose is impressive. Warm and a bit matured, round and a bit oaky. I would call this seductive. This is what I love about a good Burgundy: it combines richness with elegance: the wine is not heavy (and it shouldn't be). For now we prefer the nose over what we taste in the mouth, and I decided to slightly chill the wine. Just a tiny little bit to give this old man a bit of freshness in the mouth. Nose is complex, taste lacks a bit of life now, is a bit austere... but what can we expect? Jan says: also some vegetal tones in the nose, wet forest floor, tomato juice, a bit spicy and matured. Some facts in the meanwhile: Domaine Ponsot is the biggest proprietor of the grand cru Clos de la Roche, he owns 3,34 hectares of the total of 16,9 hectares, i.e. close to 20%! Not all of this will be old vines. Ponsot is known for picking very late, one of the latest of the côte. 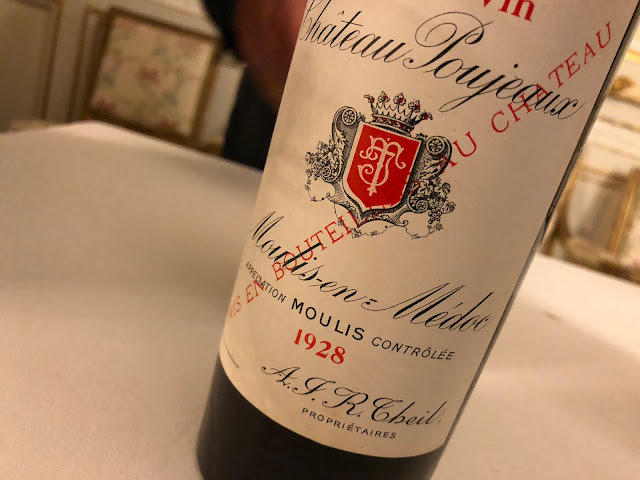 According to Clive Coates, who gave this wine an impressive 19/20 score, the wine should be drunk between now and 2015. Tasting the wine, our impression is that there's no real reason to keep this wine any longer − it would surprise us if this is getting any better than it is right now. Second glass, slightly chilled. The wine is even getting better! This touch of freshness works well. Especially in the mouth, the wine now displays a fresher round-sweet (yet lean) corpus. Beautifully mature and soft. Halfway the bottle we receive a Direct Twitter Message from Neal Martin, surprised by the coincidence that we are playing with exactly this wine: he says that he just published a vertical today about this wine. Lucky him, we only have one vintage here! But indeed a coincidence. Back to the wine. It is just lovely now. I think we will leave it at this, and simply enjoy the wine and finish the bottle. Thanks for your attention.